Two extraordinary minds: Interviews about a couple of individuals who, though slow learners as children, grew up to do amazing things. In the first half, I’ll talk with Temple Grandin, PhD, probably the most accomplished adult with autism in the world. 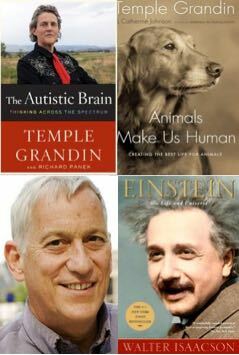 Now a Professor of Animal Science at Colorado State University and a designer of livestock handling facilities, Grandin, who didn’t speak until she was three and a half years old, has become a prominent author, speaker and advocate on the issues of Autism and Asperger’s Syndrome. The 2010 HBO film based on her life won seven Emmys, including Outstanding Movie Made for Television, Outstanding Directing – Mick Jackson, and Outstanding Actress – Clare Danes. In the second half, my guest will be WALTER ISAACSON, former managing editor of TIME magazine and Chairman of CNN, current head of the Aspen Institute, and the author of several bestselling books, including his biography of Steve Jobs. We’ll talk about his biography, EINSTEIN: His Life and Universe. Einstein discovered, merely by thinking about it, that the universe was not as it seemed. His contributions changed the way we conceive of reality. A new biography makes the point that his scientific imagination sprang from his rebellious questioning of authority – a testament to the connection between creativity and freedom. In addition to his scientific genius, he was also noted for his social conscience Besides campaigning for a ban on nuclear weaponry, he denounced McCarthyism and pleaded for an end to bigotry and racism.